180 South :: Movie Information :: RabbitTV GO! 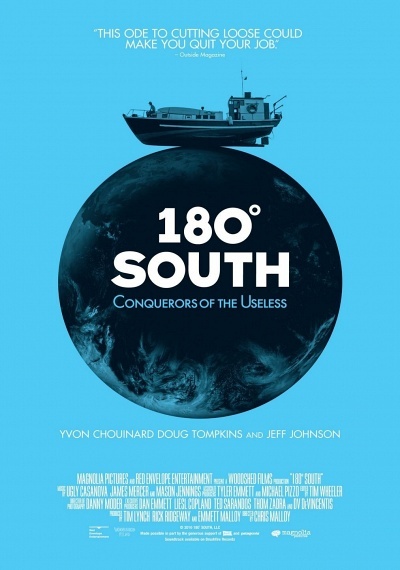 180° South: Conquerors of the Useless follows Jeff Johnson as he retraces the epic 1968 journey of his heroes Yvon Choulnard and Doug Tompkins to Patagonia. Along the way he gets shipwrecked off Easter Island, surfs the longest wave of his life - and prepares himself for a rare ascent of Cerro Corcovado. Jeff's life turns when he meets up in a rainy hut with Choulnard and Tompkins who, once driven purely by a love of climbing and surfing, now value above all the experience of raw nature - and have come to Patagonia to spend their fortunes to protect it.